Whether its a birthday party, family reunion, Bar-B-Q, wedding, or just for the sake of having a party! We make your party one to remember! Mr. 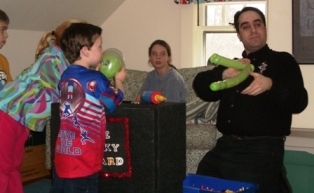 Balloon Wizard has a special family show and Balloon artistry. We also have other magic shows, balloon artists, face painters, hair braiders, pony rides, clowns, cartoonists and more! We bring all the fun to you! Promo Magic creates the magic that makes your private party special! We offer all different shows and work shops at your private party! From 3 years old to 103 years old we can entertain everyone!